The biggest night in Hollywood is right around the corner (Sunday, February 24th). Oscar night is all about great movies and the people who make them happen. Of course, it’s a fun fashion show too. With the 85th Academy Awards show in mind, I thought I’d take a closer look at a few of my favorite movies. Now, I’m no Siskel or Ebert but I’m taking a shot at movie reviews anyway. So, grab your popcorn and sit back as I take you through a few favorite flicks. NOTE: You can find these cute plastic popcorn containers in the dollar section at Target. Oh, wait. Before delving into this post, allow me to share a wonderful resource that’s all about great movies. Even though this book is fraught with movie spoilers, I still think it’s a good reference book to have in your personal library. 1001 Movies You Must See Before You Die is often re-issued by the publisher with updated reviews of new movies. OK, let’s move on to the movies. My reviews are simply based on films I’ve enjoyed seeing over and over (and over) again and they are listed here in no particular order. I think these gems are definitely worth adding to your must-watch list. The movie starts with the ambush of a U.S. army patrol in North Korea where several soliders including Frank Sinatra’s character, are taken as POWs for a period of time. When they’re finally released and return to the United States, they all begin to suffer from the same nightmare. Well, all of them do except for one fellow POW named Raymond Shaw who is strangely unaffected by his POW expererience and that lies at the heart of this political thriller. Lansbury plays Shaw’s mother and boy is she a schemer. She uses her own son and his war experience to her advantage as she persues a diabolical agenda. Sinatra tries to get to the bottom of the plot that seems to be tied to the brainwashing that he and fellow solidiers endured during their POW captivity. Angela Lansbury is positively sinister (nothing Jessica Fletcher-ish from Murder She Wrote) in this film which centers around internatonal espionage, revenge, betrayal, mind control, fear of communists and political assassination. Yes, there’s a lot going on in this movie but you’ll like it. If you love period films, lavish costumes, British accents (and Richard Burton), you’ll enjoy this take on the ill-fated romance between Anne Boleyne and King Henry XIII. Anne is portrayed as initally fiercely resistent to the sudden royal attention lavished on her by the boorish King Henry. However, as the king pursues her, Anne gets a taste and appreciation of the power in the word “no“. Saying “no“, gets her just about everything she wants but as they say, be careful what you wish for. Boleyn eventually changes her tune about Henry but by then he’s changed his tune about her. Thanks to history, you know how this movie will end but it’s still an entertaining version of the rocky royal relationship that according to the Boleyn character, spanned a mere one-thousand days. On the surface, 8-year old Rhoda seems prim and proper but under her perfectly coiffed pigtails she has a very dark side and a homicidal instinct which she relies on whenever she feels threated or doesn’t get her way. She deflects suspicion with an ingratiating and totally phony presentation that fools just about everyone around her including her increasingly anxiety-ridden mother, who slowly and painfully starts connecting the trail of fatal dots left in Rhoda wake. The gradual change (visual and otherwise) in the mother’s character from sunny disposition and gorgeous to drawn and fearful is an amazing on-screen transformation you can chalk up to good make up and great acting on the part of Nancy Kelly. An on-screen request at the end of this movie implores movie watchers not to reveal the unusual ending. I’ll only say it’s an interesting twist. The nation needs a vice-presidential nominee after the sitting VP dies in office. Jeff Bridges portrays the president who taps the first-ever female veep candidate to take over the vacant slot. Joan Allen is one heck of a candidate too with all the right smarts, experience and credentials. However, her detractors dig up what appears to be a sordid, promiscuous past which threatens to derail her nomination. She complicates her confirmation hearings by refusing to explain, defend, discuss, confirm or deny the accusations and smears against her arguing against what she considers a double standard. “If I were a man, these questions would never be asked”, she says as she maintains her silence. Gary Oldman (one of my favorite actors ever) has the ability to fully embody whatever character he is portraying and this role is no different. Oldman’s character is totally believable and comes across in the same way many real-life politicians do today. 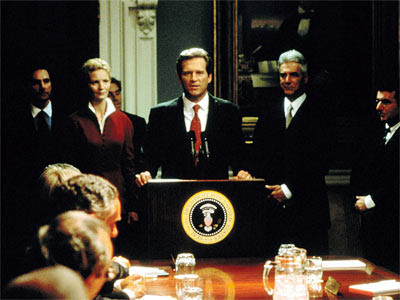 While this movie dramatizes a fictitious confirmation hearing process, the destructive, vicious, and underhanded-behind-the-scenes machinations suggested in the film have a familiar ring of modern-day truth. Jack Crabb (Dustin Hoffman) is 121-years old but his mind and memory are like a steel trap and his recollection of how the west was really won is the basis for this film. Crab’s story unfolds when he is just a young boy, after he and his sister witness the killing of their parents at the hands of Native Americans. They’re both kidnapped but his sister ultimately escapes into the hills. Jack ends up being raised by a sensitive and good-natured chief who treats him as his own, imparting a love of the people, reverance for the land as well as a respect for the bounties given by nature. The chief renames Jack, Little Big Man as a nod to his bravery and his short stature. Jack’s story moves back and forth between life with American pioneers and life with Native Americans as he struggles with his own identity. Throughout the movie, Jack comes in contact with various historic figures of the west including Wild Bill Hickock and General George Custer. The threads that run through this film are comic, poignant, tragic, heartbreaking, conscious-raising and sentimental just to name a few. In the end, I think you’ll walk away from Little Big Man with a lump in your throat. I did. If you’re a sucker for an old fashioned love story, you’ll enjoy this one (you’ve probably already seen it, right?). Roman Holiday was Audrey Hepburn’s first lead film role. Hepburn portrays a princess who feels burdened and put-upon by her heavy royal duties. So, during an official visit to Rome, she eludes her security detail and bolts for the day to explore the city on her own. She runs into Gregory Peck, an ambitious news reporter, who pretends not to know Hepburn’s true identity so he can score a scoop for his newspaper. Eddie Albert plays the sidekick photographer who is in on the caper and covertly snaps photos of the princess throughout the day as she runs amock in the city. You know where this is going, don’t you? Of course, the reporter falls for his news subject and she falls for him. I don’t think anyone could resist the young, dashing Gregory Peck in this film. “I’m mad as hell and I’m not going to take it anymore“. That’s the classic battle cry uttered by a beleagured and aging TV anchorman who becomes a messianic figure on network television. Howard Beale’s television show on the UBS Network is in the ratings dumpster and his bosses decide to pink slip him. He goes on the air and tells viewers he’s going to kill himself on LIVE TV and he encourages everyone to tune in to watch. Viewers oblige and Beale’s ratings suddenly go through the roof and the UBS Network execs decide to keep him on the air egged on by an exploitive, hard driving and emotionally bankrupt producer (Faye Dunaway). Beale becomes a huge hit and despite his clear mental unbalance, he becomes a highly successful and influential “Mad Profit of the Airwaves”. However, Beale’s slow descent into madness is hardly fit for public consumption and his decline is recklessly ignored by news bosses whose initial corporate-profits-above-all-else attitude drives every decision about on-air talent which keeps Beale on the air. The success of Beale’s show paves the way for the emergence of a wickedly entertaining array of new TV shows and nutty TV hosts on the UBS Network, as crazy becomes the new normal. Sound familiar? This movie may be more than three decades old but the themes exhibited are as timeless as ever. Chauncey Gardener is a mentally challenged man with very simple needs. He has spent his entire life sheltered from the outside world while tending the garden of an elderly, wealthy Washingtonian. When the wealthy benefactor dies Chauncy is thrust into the city beyond the garden gate with no skills and only a young child’s knowledge and understanding of just about everything. Yet, despite his obvious shortcomings, this simple gardener manages to rise to the very pinnacle of U.S. political power and privilege. A chance meeting puts Chauncy in the path of a very powerful circle of movers and shakers who mistake his child-like behavor, observations and simple declarations on gardening as profound, intellectually nuanced and politically insightful. The joke is on them. There is a scene at the very end of this movie that will make you think twice about the Chauncy Gardener character and his true identity but I’ll never give it away here. I’ve seen this movie half a dozen times and the ending still makes me go Hmmmm. That’s a look at a few of my favorite movies. I’d love to know if any of my reviews piqued your interest so please let me know if you end up watching any of the films I’ve mentoned here. Lisa, You are amazing! Such talent! I think you must not need sleep and just keep on creating! My son also has an Emmy on his mantel, and many nominations. He was the DP on Mad Men. I am sending my wonderful daughter in law a link to your site. Your site is by far my favorite! Lisa what a wonderful post. I am absolutely loving your blog. So happy I found you Hugs! What a great list Lisa! I love movies and watch a lot of them, but I’m shocked to say I’ve only seen one on your list (Anne). Thanks for the reviews — I’ll have to crank up my Netflix! Ditto, Roman Holiday, Network. I’m going check Netflix for The Bad Seed. These are wonderful movie suggestions and I’ve written them down. I love old black and white classic’s and would spend a good rainy Saturday home watching them, if I could. Thank you so much for sharing your favs. I for one welcome you to continue to share your favorite movies and books. I can’t wait to view/try your caramel popcorn recipe. I’ve made it before and it was JUST ok, so I would love to try your recipe.